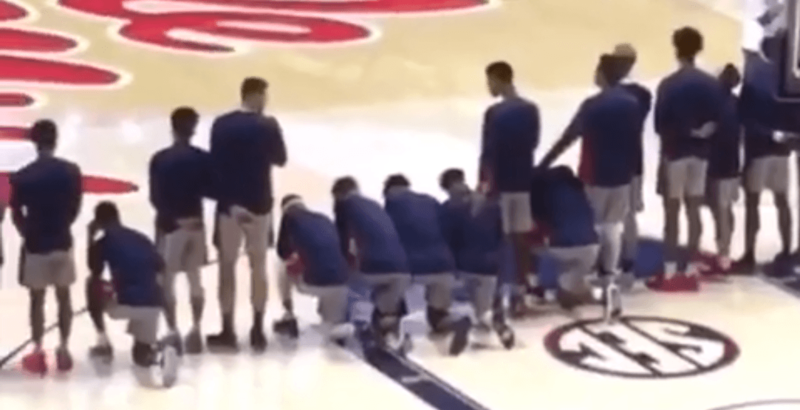 On Saturday, several Ole Miss basketball players chose to kneel during the national anthem in response to a pro-Confederate, white supremacist rally being held on campus. Two groups, The Hiwaymen and Confederate 901 who both describe themselves as “patriots” were on campus to protest Ole Miss’ choice to discontinue use of “Colonel Reb” as their mascot. They were also counter-protesting the Students Against Social Injustice, who on Friday staged a protest against a Confederate statue located on campus. In previous comments, Davis implied that kneeling wouldn’t be tolerated, saying “We’re going to be a respectful team that respects the flag and the national anthem. All those things from culture is what we’re about.” However, when briefing the media after the game, Davis said, “Our players made an emotional decision to show these groups that they are not welcome on our campus, and I respect our player’s freedom and ability to choose that.